Thread: You want to talk about crappy design? Mazda has the Kodo design team on it for 2019. Give the old one to your office manager and have a good laugh when they spill it on those precious carpets they are in charge of maintaining. OP don't worry. Mazda will come out with a revision soon. At least it still handles really well though right? I liked the Gen 1 better. Next gen will have a beeper when coffee gets to close to the top. Do they have a left handed cup? Those went out the door with Ford, when you had to flip over and read directions. Not sure if you're being serious about the "Really Mazda? Did ya not have people try this thing out before you approved it? " part, but it has nothing to do with Mazda. Some company that makes corporate apparel and other things like coffee mugs and keychains sends a pamphlet to the dealer, a manager picks what he wants and the company puts the logo on it. I'm not sure if we still do, but at one time we had ceramic coffee mugs with a travel mug style lid. They were popular! Well, I think we're all just having a good chuckle here about travel mugs, so don't take it too seriously. I worked in the corporate world for many years, and we used to buy stuff like this to give to our employees and customers as well. There was/is a lot to choose from, and you just added your company logo to whatever you bought. 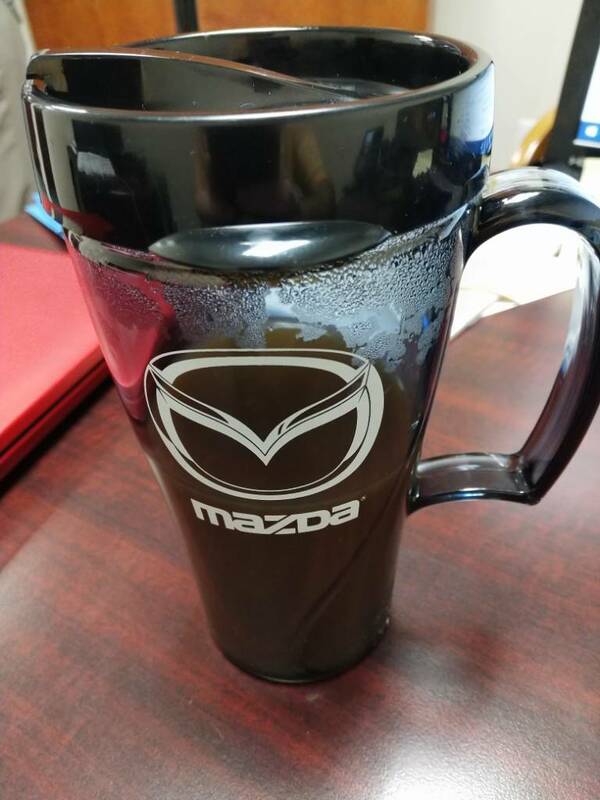 So,....if someone at Mazda picked this particular cup from a choice of many, then the choice of mugs does have something to do with Mazda. Obviously Mazda didn't make them, but someone made an executive decision to buy this particular model, so yea, Mazda does have something to do with it. Personally, I buy the cheapest travel mugs I can find at Wal-mart, and then promptly lose them or leave them behind somewhere. I also have an extensive collection of mugs and lids, none of which match up. Lastly, I have a tendency to put them on the roof while I'm loading my car/truck, and then driving away. Lost/broke more than one that way. In the long run, take out cups from Tim Horton's seem to work the best for me. Total humor post however that plastic top piece looks a LOT like half of the Mazda logo. I'm not so sure these are my dealer only. But car companies? Saab had those types of things available on line and at every dealer...as does Volvo. Next time someone goes to the dealer, see if they sell these cups. is anyone else getting crappy MPG? What is up with crappy vB?